The local beach of Port e Vullen, 10 minutes walk away, is popular with our visitors. The buildings are all of Manx Stone with a glazed dining area and outside picnic benches. Accommoation is split over 2 sets of buildings "North" and "South" camp giving a total of 120 beds. The number of beds in each room can be altered to suit your requirements (by prior arrangement). The bunkhouse offers self-catering facilities with the option of purchasing meals from the neighbouring adventure centre if required (subject to availability). Most bedrooms are en-suite with full central heating. Facilities comprising of games room and kitchen are basic but functional and provide an ideal base to explore the Isle of Man or get involved in some of the activities offered by The Venture Centre. All guests should bring their own bedding/sleeping bags. Pillows and pillow cases are provided. Suitable for Scouts, guides, youth groups, sports clubs, families and individuals.Prices are per night based on arriving no earlier than 12.00 midday and departing by 10.00am on the last day of visit. The bunkhouse is open all year round. 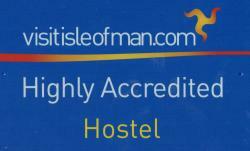 Special rates from £15 per person per night this is based on dormitory accommodation. We expect due consideration to be shown for centre neighbours and other residents. Groups wishing to make excessive noise especially after 10.30 p.m. must seek accommodation elsewhere. No smoking inside any of the centre building or in sight of any children resident at the centre. The bunkhouse is situated adjacent to the Venture Centre activity centre where you may arrange sessions of kayaking, abseiling, assault course, air rifle shooting, archery, gorge walking, dinghy sailing, power boating and team challenge events. Grid ref 469 922. Approx 45 minutes drive from the airport and 30 minutes from the ferry. Ramsey, the premier town of the North of the Isle of Man is just 1.5 miles away with full shopping and medical facilities and of course the 12.5 acre Moorage Park boating lake. Buses to the Wildlife Park, Peel and other parts of the Island depart from Ramsey. The Venture Centre has its own stop 'Lewaigue Halt' on the unique Manx Electric Railway (founded in the 1890's) this gives you access to Douglas and the South, mountain walks and tranquil glens.